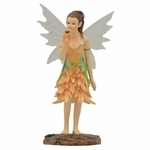 This striking figurine features a fairy sitting cross-legged. She wears a dress of blue with orange accents, and has tan wings to match. 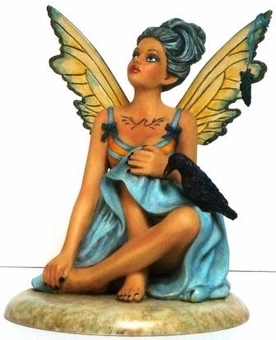 A raven perches upon her leg, and a feather dangles from one of the pixie's wings. This collectible is sure to add a touch of unique mystery to any faery lover's decor!